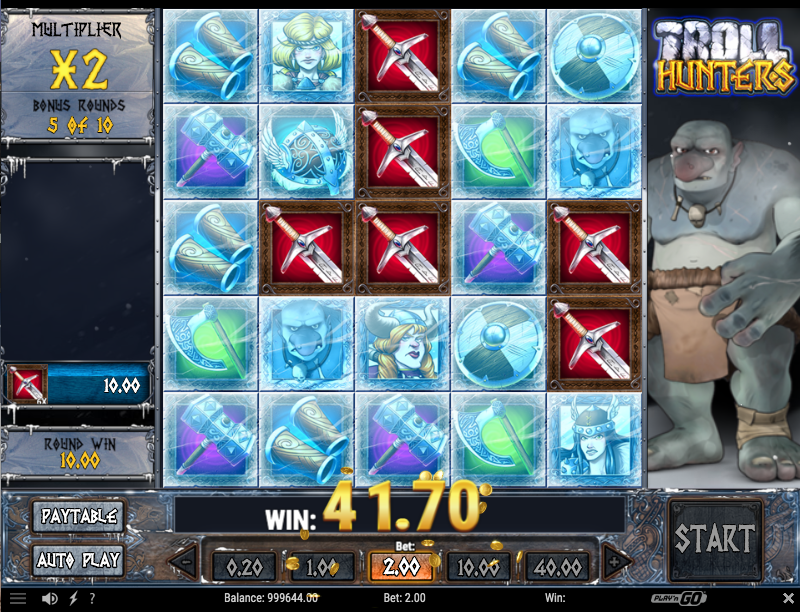 Troll Hunters is a mythical slot adventure from the leading software developer Play’n GO. Trolls hunting is dying down these days but in the past. It was a common thing in Scandinavia to pick up your sword, and only return when you had a giant creature’s head dragging along the ground. This slot game will take you back to the famous Norse mythologies. As you wander throughout those Scandinavian lands, you also get to enjoy snowy mountain views with a clear blue sky. The game’s sound effects boast mysterious, haunting sounds and tunes, which also accompany you on your adventure. Before you decide to join the vikings, you need to ensure you set your preferred slot game coin size with coin sizes ranging from 0.2 to 40. There are no traditional win lines and the only choice a player has to make is the stake amount for each spin with the minimum betting amount being 20c and the maximum betting amount being 40c. Troll Hunters is played out on a 5×5 grid symbols. Slot with no pay-lines but has free spins, bonus symbols, and multipliers. The game offers it’s players an RTP of 96% and a non-progressive jackpot of 700 coins. The multiplier wins in the game are found in the slot game and are progressive when you get continuous wins until your win gets a 500x multiplier. Symbols in this video slot represent brave female vikings as the title Troll Hunters. Aside from them, there are also cups that are made of silver earrings, skulls, and meat loaf with bones sticking out. Wild symbol is the golden rune and it appears in the middle of any paid combinations, in the hope of creating consecutive wins and free spins. Get multiple wins in the base game and reveal the word ‘BONUS’ will trigger the Troll Hunters free spins. During free spins, you need to land winning combinations with five symbols as every symbol acts as the game’s Scatter. Moreover, landing five or more Troll symbols will trigger five more spins up to a maximum of twenty. The slot game offers a nice combination of quality design and exciting gameplay. The cascading reels keep the action flowing in the base game with the feature offering more of the same. The variance here is in the medium range, offering a balance between frequency and size of payouts. PLAY TROLL HUNTERS SLOT GAME TODAY! This journey is definitely worth taking, let’s go hunting trolls! Win real life Malaysia Ringgit in cash whenever you hit the right matches. Start playing on the number one Online Casino Malaysia and Sports Betting website today – lala88.com ! Instantly qualify for a special new player bonus when you join and play today!